Agreed Narkee, throroughly enjoyed todays game. Incredible effort from the dogs to beat WCE at subi, hawks at the G, GWS at spotless and then the Swans in the big dance. 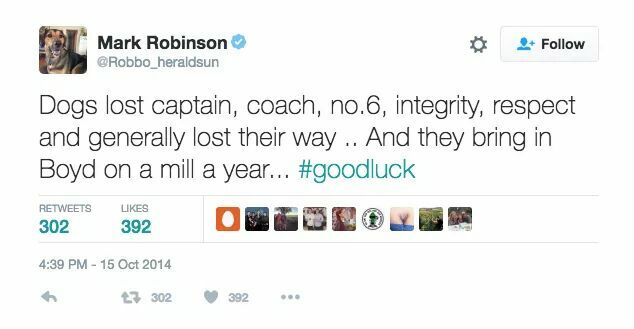 To be fair to Robbo, how many of us disagreed at the time. Just shows how much work Bevo has done. Cracking game of footy that one, one of the all time greats. Enjoy it Divvy, after the year the Dogs injury wise had I didnt think they were a chance of making the GF, but Bevo has done amazing things with that group. The outpouring of emotion yesterday from supporters and former players of the club was incredible to see, its what footy clubs are all about. Though JJ was a strange pick for Norm given how much he butchered it. Heard that he had over 800m gained though which was by far the most on the ground, and thats a pretty important stat. Would have given it to Tom Boyd to be honest, his second half was instrumental in the win! Many congrats @divvydan , a true Cinderella story. Terrific game for a neutral to watch, the intensity was epic. Bevo giving his medal to Bob was an iconic moment, one of the most selfless acts I have seen - shows what an amazing man Bevo is & what Bob means to the dogs. Pickens was my pick for the Normie, another great game by him - the player of the finals series for me.